Marcus and I went away for the long weekend and the lawn was looking a little raggedy before we left. I'd been looking at it ruefully, knowing that it was going to be a beast when I got back, but not willing to put off the weekend for one single minute more. It had been a glorious weekend and the corn had literally grown a foot while we were gone. So had the lawn, or so it seemed. Eyeing the out of control, sun drunk, extra long grass blades balefully, I pulled out the reel mower and prepared to do battle. I love my reel mower. After a full season of use, the blades are still razor sharp. The grass never stood a chance. It was a little more effort to push it through the extra long grass, but since I haven't been to the gym in a week, I figured it was the least I deserved. I was actually wondering how to make it into a crossfit workout. 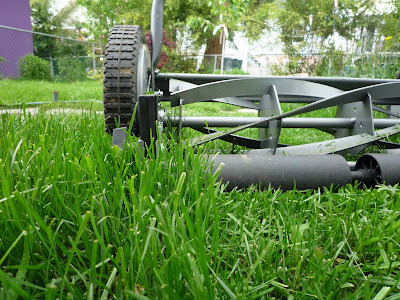 Make it a metcon by cutting the lawn via 21-15-9 lawnmower thrusters, lawnmower burpees, and lawnmower deadlifts? Maybe a grinder by cutting all the neighbours' lawns as well? But I digress. My neighbour came out to comment (again) on how nice and quiet the mower was and to apologize that his (electric) was going to noise up the neighbourhood. As I was chatting with him and daydreaming about crossfits WODs, the Insane Dog jumped into my path and flung her ball right into the reel in a mad attempt to get me to throw it. No harm done, the ball stopped the reel immediately, and her attempt to cut her nose off while retrieving her ball was foiled. Reels are super safe to have around kids and dogs. I thought about raking the extra long trimmings but decided instead to just go over them a couple more times. Who knew that a reel mower could actually be a mulching mower? I've found that by doing this, we use less water and I can help the dog pee-killed spots fill in a little. Our mowers have all been (almost) free so we've never had one that quite suits the lawn. The first was a battery assisted Gardena that I got for a steal at a yard sale. It was fantastic but too big for our little space. It was heavy, but the assist made it almost pull itself along. It was older and so eventually the battery died. We elected not to replace the battery and got a Great States 18 inch model on points. Again, I love it for all the "reel" reasons, but its still too big for our yard. I wish we'd done all the research we've now done now on reel mowers, before we got a new one. If we'd only known then what we know now.... we would have got a much smaller model, maybe a 14 incher. Do yourself a favour and get a reel mower, but get the one that's right for your lawn size, topography and grass type. Read what we wish we'd known before we bought, and you will be even happier with yours than we are with ours. 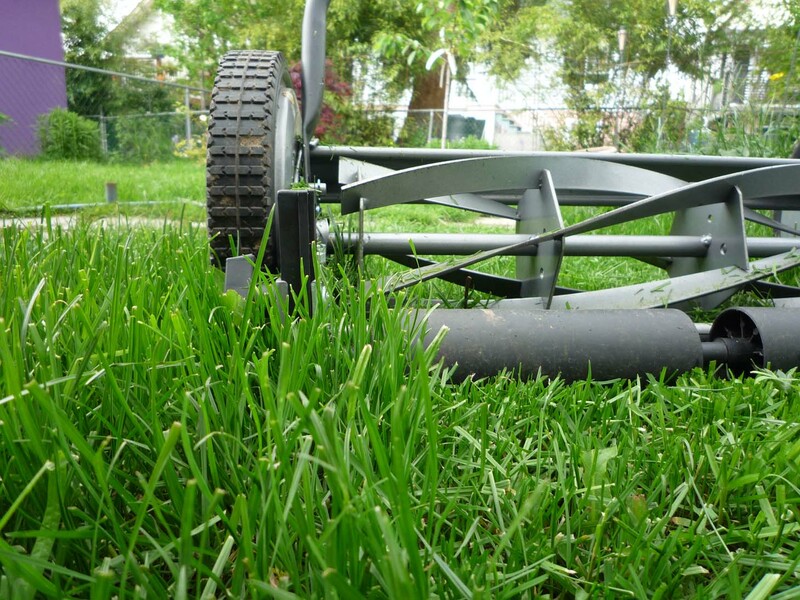 Here's the lowdown: Choose the Right Reel Mower for You. So what are the ways?